Place Thru MFT connector in your Flow as applicable for your use case. To use the Thru MFT connector in Mule application flow, you must configure the Global Element Properties (XML tag ) per each Flow. 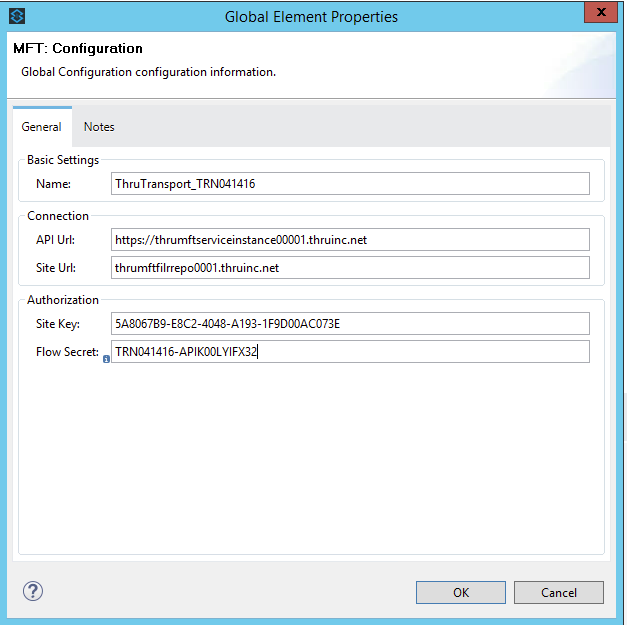 Global element properties will be used by Thru MFT connector instances running in the Flow and are used for authorization purposes to communicate with selected instance of Thru MFT service and selected Transport in that service instance (read more about Global Elements). 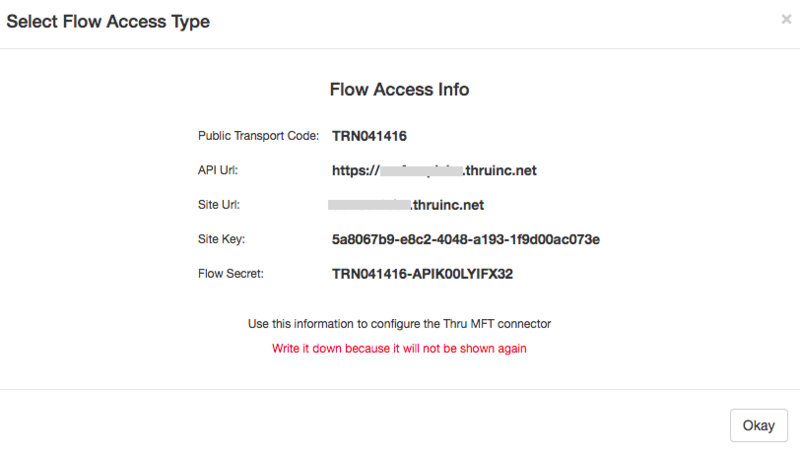 API Url Url defines Thru MFT instance running the Transport to which Thru connector communicates. Provided to administrator when web API access is configured for a Transport in Thru MFT portal, see screenshot below. Site Url Url defines a file repository used by Thru MFT. Provided to administrator when web API access is configured for a Transport in Thru MFT portal, see screenshot below. Site Key API Key for the connector to access Thru MFT instance. Provided to administrator when web API access is configured for a Transport in Thru MFT portal, see screenshot below. Flow Secret A secret key for Thru MFT connector in given Flow to access selected Transport. Provided to administrator when web API access is configured for a Transport in Thru MFT portal, see screenshot below.